Day 19, Floral nails...hmmmm. I'm a fan of rose nail art. I love it. My first day of this challenge I did red rose nails, which coming up soon I will have a tutorial for :). To me, they're easy and so pretty on the nail. 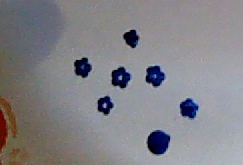 Something I can never do though are dot flowers. You know, the simple five dots and a center. Something so simple eludes me, and I have no idea as to why. For this day, I wanted to do that. I needed to master the dot flower and be victorious over something so simple. If I could do monarch wings, converse, and owl half moons, a dot flower should not be so bad for me. Nicole from Young, Wild, and Polished, to me, is the dotting tool, dotting flower, and water marble expert. Seriously, this girl is a pro. All her dots are flawless, perfectly round and circular. I swear she has a stencil or something. Her dot flowers, perfect as well. Each time they are amazingly perfect, cute, and ugh jealousy is now rising in me as I type this. If you haven't checked her out, please do. Love her blog. 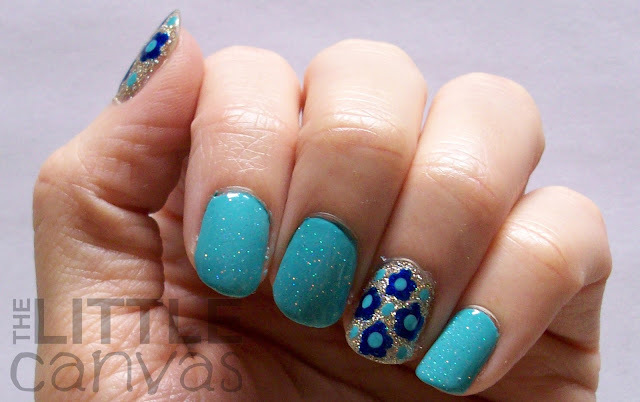 I came across a few dot flower manicures I really liked. Since I had just had black on my nails, I decided to not try to re-create her black and grey ones. Okay, the real reason was that it was too many flowers and I was scared I'd mess it up. My eye kept getting caught though on a pretty manicure she posted using the Essie Winter Collection polishes. I had to do it. Since I didn't own the Essie's, I ran to my stash and found some dupes. Let's take a look. I'm experimenting with shooting pictures inside now that the weather is nasty, so please bear with me as I figure everything out. If you have any pointers, please share! :) It's going to be a long winter. 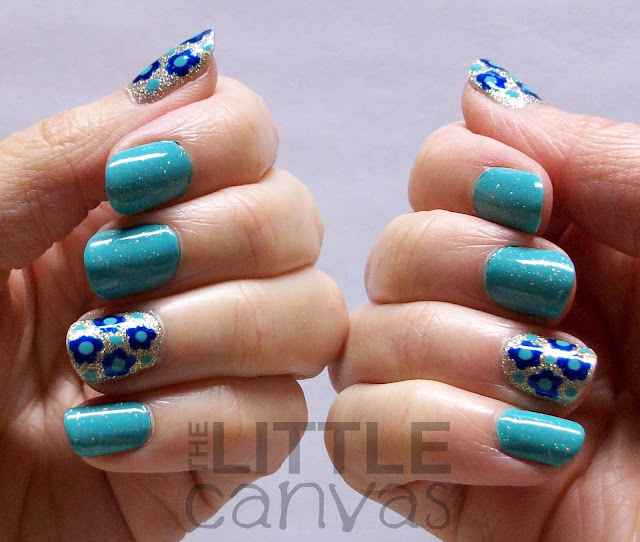 Let's take a walk through of how I did this manicure. First, I obviously found my dupes of the Essie bottles Nicole used. I recieved Julep - Robin a long time ago in a giveaway I won over at Polish Pixelle. I threw it in my stash, because at the time, I really had no use for it. There it has sat, unloved and unused. For this manicure, I used three coats of it, and probably could have gotten away with two. It applied really nice, I'm kind of upset Julep bottles are so dang small. It probably will be used for this mani, and then savored and rarely touched. I then grabbed China Glaze I'm Not Lion and painted my accents with two coats. Gosh, love this polish. I then went out to the store because the whole dot flower thing was freaking me out. I was so happy with the bases that I really did NOT want to ruin them by attempting flowers. 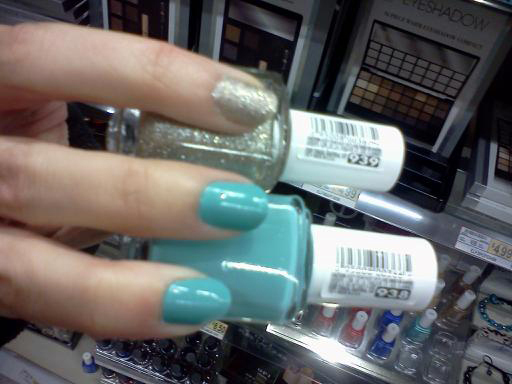 While at the store, I stumbled upon the Essie Winter Collection and picked up the bottles that Nicole used. I was so thrilled to see that they were pretty much identical dupes. I took a crappy cell phone pic in my happiness. Check it out. So happy. I then came home, sat down, and decided it was time to finish the manicure. I grabbed a paper plate, and started practicing the flowers. I added some Fairy Dust to my Julep nails because the plain color was kinda freaking me out. I'm not one for simple, my creams need to have some form of glitter for me to love them. In the end, I was in love with this manicure. It was so simple and pretty, I just could find nothing to hate about it. Made me see that I don't have to do extensive nail art to be in love with my nails. Thank you Nicole for allowing me to steal your design! What do you think?! Are you a master of the dot flower? Do you like the simple mani? 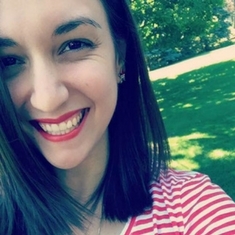 Don't forget to check out the other lovely ladies! It's seriously by far my favorite glitter! Lol thank you! I always take photos inside and i always try to shoot with the natural light from the window, usually without flash, but it depends... Works for me every time because the natural light helps to show all the colors of the nail art and not over brightens them. Love the blue background color! <3 It's my number one choice of the color in everything! Hmmm, I may have to try that by the window next time. I took these under a florescent light which probably wasn't the smartest decision. The pictures came out decent. And thank you! it's one of my favorite polishes now! Love the manicure! It almost reminded me of leopard print at first glance! ahhhh that's such a good idea!!! I"m going to try that next time! thank you!!! 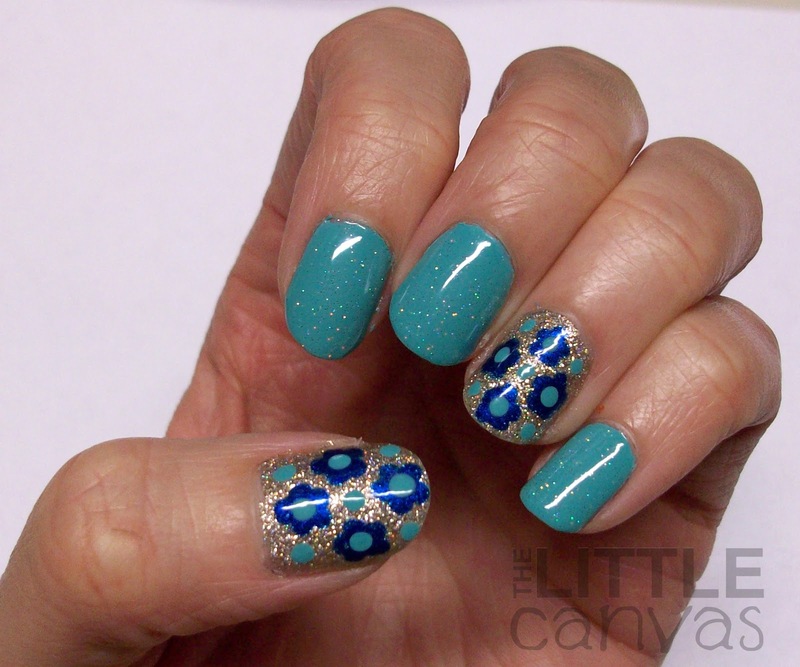 Guest Post from Kat at Hooked on Polish! A Nicole by OPI Surprise!